Home › Watermelon Slicer & Server, Perfect Stainless Steel Fruit Cutter and Corer, Easily Slices Cantaloupe To Scoop. We've added a safety handle to avoid those little cuts on your fingers. Watermelon Slicer & Server, Perfect Stainless Steel Fruit Cutter and Corer, Easily Slices Cantaloupe To Scoop. We've added a safety handle to avoid those little cuts on your fingers. PERFECT COMPANION FOR A SUMMER PARTY - Your perfectly sliced melons will be the talk of the party. Slice them or cube them - the choice is yours! Use your slicer as a scooper to serve your guests some mouthwatering watermelons, cantaloupes, honeydew and more - with no messy cleanup! PRECISION-ENGINEERED TO DELIVER PICTURE-PERFECT WATERMELON SLICES - Our watermelon slicer is artfully designed to allow you and your loved ones to easily slice up some irresistible summer melons in seconds! The ergonomic design allows an easy grip that facilitates the slicing and scooping of all melon slices! Our unique design slices from the bottom, so you leave the rind behind! BUILT TO WITHSTAND THE ELEMENTS - Our watermelon slicer sets the industry standard for kitchen gadgets. Don't settle for anything less. One piece construction made from the finest stainless steel to guarantee top performance. Dishwasher safe Stainless Steel so you can use your slicer over and over again. You'll fall in love with your new slicer as soon as you get it. Your search for the perfect kitchen gadget for your summer parties is finally over! 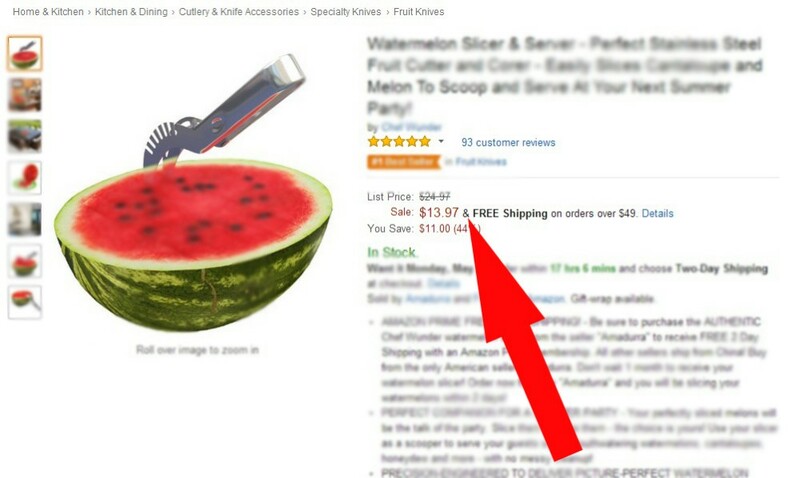 Your new watermelon slicer will slice and scoop up melons in seconds! With the Chef Wonder watermelon slicer, you will be getting a cutting edge design (literally) that is engineered to give you perfect slices for your next summer party - leaving behind only the rind! Designed for multi-functional use. Use it as a slicer and a scooper - no need for additional tongs!